From September 30 to October 1, H.E. Mme. 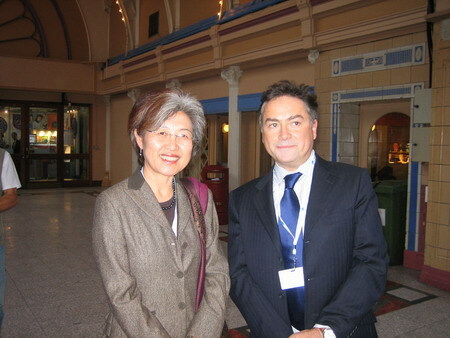 Fu Ying attended Conservative Party Conference 2007 as a special guest in Blackpool, a coastal city in Northwest England. During her visit, Fu Ying not only listened to the speeches in the conference, but also met Liam Fox MP, Shadow Secretary of State for Defence, Andrew Mitchel MP, Shadow Secretary of State for International Development, David Lidington MP, Shadow Minister for foreign Affairs, Geoffrey Cliffton-Brown MP, Shadow Minister for International Development, Mark Hoban MP, Shadow Minister to the Treasury, David Ruffley MP, Shadow Minister for Home Affairs etc. 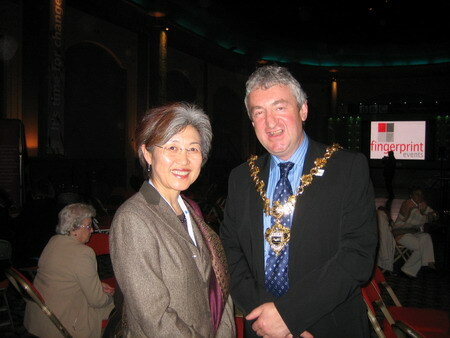 She also attended the reception held by Robert Wynne, Major of Blackpool. David Lidington MP welcomed Fu Ying for attending the Conference and spoke highly of the economic and social developments in China and the development of Sino-UK relations. He thought that with the increasingly strengthening of Chinese economy and the important roles of China in the international community, the UK government and people are paying more and more attention to China, but the UK People did not have enough understanding of China and they hoped that China should strengthen self-introduction to the world. Mark Hoban MP, who had just returned from China, said that the visit was very impressive and deepened his understandings of China and the policies of Chinese government. Chinese economy is keeping the momentum of high-speed development and the development of the foreign trade was very fast, more and more Chinese enterprises were going abroad but China was also facing such challenges as mitigating the financial risks and responding to the climate changes. The Conservative Party welcomes Chinese enterprises to invest in UK and is willing to actively promote the cooperation in economy, trade, finance and environmental protection. Fu Ying said that she was delighted to attend the conference and meet members of the Conservative Party. Fu Ying noted that Sino-UK relations kept a good momentum at present, the cooperation in all fields were deepening and the unofficial exchanges were increasing, but there was still great potentials for the development of the bilateral relationship; UK has its advantages in financial service, high-tech and environmental protection, both sides can further strengthen their cooperation in these sectors and have greater space for their exchanges in culture, sports and tourism. The serial events "China Now" will be held all over UK and Beijing will also hold the Olympic Games. Fu Ying believed that these activities will promote the overall and objective understandings of UK public to China. Fu Ying welcomed more members of the Conservative Party to visit China and continue their efforts to promotion of the bilateral cooperation, the link between the industrial and commercial circles of the two countries, and the mutual understandings of the two peoples. Both sides also exchanged opinions on the Burma issue. Fu Ying introduced the status quo of the Sino-Burma relations and noted that the two countries shared a common boundary of more than 2,200 km and were carrying out effective cooperation in the fight against drug smuggling and maintenance of the safety of the boundary. China is concerned about the situation in Burma like the international community and hopes that the things could calm down as soon as possible and Burma can realize the national reconciliation and democratic development. Fu Ying introduced the work China had done and noted that China was willing to make efforts together with the international community so as to prevent the issue from becoming acute and promote a proper settlement. But like other countries, China could not dictate the Burma government. Other countries should have an unrealistic expectation of the role of China. The principles for China to develop the relations with other countries were mutual respect, equality and mutual benefit, and non-intervention into other country's internal affairs.